Bakula (Skt. ; Tib. བ་ཀུ་ལ་, Bakula; Wyl. ba ku la) — one of the Sixteen Arhats. Born 70 years before the Buddha, Bakula was first an accomplished scholar and then lived as a wandering ascetic. One day, seated high on a mountain he saw the Buddha passing on the road below. Afraid he would not be able to catch up with him by following the road he jumped directly from the mountain-side, but was spared from injury by the power of the Buddha. He requested ordination and joined the Sangha. After studying and practising he became an arhat. Together with 900 arhats, Bakula dwells on the northern continent (Uttarakuru) in a mountain cave. 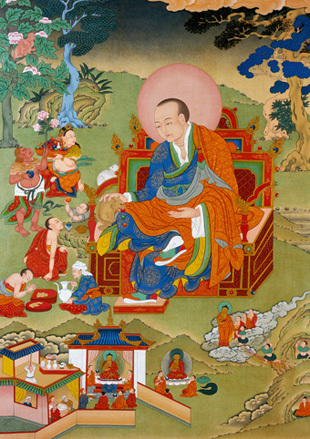 He holds a wealth-bestowing mongoose that has the power to grant the requisites for understanding all of the Buddha’s teachings—refinement of the five senses, the ability to attain the six paramitas, understand shunyata and manifest love and compassion for all beings. This page was last edited on 12 December 2016, at 12:15.